The March 2 sit-in is expected to be the largest act of civil disobedience by young people in the recent history of the environmental movement and it will be led by just the demographic that helped propel Obama to the presidency. The protest, known as "XL Dissent," is meant to send a clear signal to President Obama that the base that helped elect him sees Keystone XL as a decision that will define his entire legacy. Here we go again. With President Obama on the cusp of a decision on whether to approve the Keystone XL tar sands pipeline, on March 2, hundreds of students and young people are expected to risk arrest in an act of civil disobedience at the White House to pressure President Obama to reject the project. The sit-in is expected to be the largest act of civil disobedience by young people in the recent history of the environmental movement and it will be led by just the demographic that helped propel Obama to the presidency. 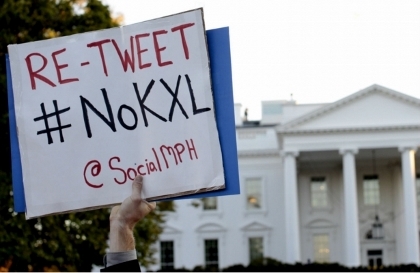 The protest, known as "XL Dissent," is meant to send a clear signal to President Obama that the base that helped elect him sees Keystone XL as a decision that will define his entire legacy. "Obama was the first president I voted for, and I want real climate action and a rejection of the Keystone XL pipeline," said Nick Stracco, a senior at Tulane University. "The people that voted him into office have made it absolutely clear what we want, and that's to reject Keystone XL." The tar sands, also known as the oil sands, are one of the largest remaining deposits of oil in the world, and efforts to extract the resource from a mix of clay and other materials underneath Canada's Boreal forest have created the biggest, and by the accounts of numerous scientists and environmental groups, one of the most environmentally devastating energy projects on earth. For details and background, the Natural Resources Defense Council has compiled an extensive document. As the fight to stop KXL enters its final stages, it's truly inspiring to see young people at the forefront. This pipeline is scheduled to last 40 years - right through the prime of their lives. President Obama needs to look them in the face. 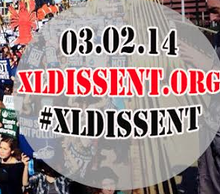 The "XL Dissent" protest on March 2 will begin with a march from Georgetown University to the White House. After a rally in Lafayette Square, hundreds of students and young people are expected to risk arrest at the White House fence. The day before the protest, students will meet for a nonviolent direct action training and fossil fuel divestment conference. Get more info and sign up for the march; find out exactly what's being planned and see how you can help the cause, whether you can be in DC on March 2 or not. Copyright c 2014 The Nation. Reprinted with permission. Distributed by Agence Global. The Keystone XL pipeline is set to bring toxic tar sands from Alberta, Canada to the Gulf Coast, where it will be refined for export. As young people we've had enough: approval of the pipeline would ensure that our generation takes on the risk of oil spills, increased toxic pollution from refineries, health disasters, and a exacerbated climate change. Join us in Washington DC March 1-2 to tell President Obama to reject the pipeline to protect us from a future defined by climate chaos. The Keystone XL pipeline, if approved, would carry over 800,000 barrels of tar sands oil-best described as a semi-viscous, carbon intensive, toxic injustice-through America's heartland each day. Tar sands oil is a disaster at the point of extraction, where it causes cancer rates to spike and destroys local ecosystems, all the while violating the treaty rights of Canadian First Nations. It is a disaster when transported, as both the recent railroad crash in Quebec and the recent pipeline spill in Arkansas have made strikingly clear. It is a disaster when refined, exacerbating cancer and asthma clusters, and doing so mostly in low-income neighborhoods and communities of color. Tar sands oil is an absolute disaster at the final stage, when it is burned and carbon pollution is dumped into our skies. This carbon serves to further destabilize our imperiled atmosphere, threatening society with one of the greatest crises it has ever faced. The decision on Keystone XL will be the definitive test of President Obama's character and integrity. Moreover, it will be a crucial arbiter of his legacy, impacting history's verdict on his presidency far more than incidents such as the Benghazi affair or the NSA ordeal could. Last July in a speech at Georgetown University, President Obama said, "And someday, our children, and our children's children, will look at us in the eye and they'll ask us, did we do all that we could when we had the chance to deal with this problem and leave them a cleaner, safer, more stable world? And I want to be able to say, yes, we did." We ask, because President Obama's willingness to govern in an environmentally responsible manner has been called into question. At Georgetown, President Obama promised to review the pipeline based on whether it would have a significant impact on the climate. But in the months since that speech, the State Department has continued to rely on ERM (a dues-paying member of the American Petroleum Institute) to run the environmental review of the pipeline. That's despite the fact that ERM has a close business relationship with Transcanada. And that it was later caught red-handed for lying to the State Department in order to cover up those business connections. President Obama has indeed made several responsible choices, such as increasing the mileage standards for cars. But he has also made some disastrous ones. He opened vast swaths of Western lands for coal mining, repeatedly endorsed an "all-of-the-above" energy approach, and even supported the Southern leg of the Keystone pipeline. We will proceed to engage in an act of peaceful and principled civil disobedience at the White House gate. We hope that this action will set the record for the largest single-day act of civil disobedience at the White House in American history. You will learn about the exact details soon, but for now we can say that this will be different from previous White House protests. Emboldened by our passion and our frustration, we will partake in an unprecedented action to denounce the Keystone XL pipeline and the "all-of-the-above" energy approach that makes such fossil fuel projects possible.